This is primarily useful for testing the analysis. Definition at line 1262 of file LazyCallGraph.h. Definition at line 1742 of file LazyCallGraph.cpp. 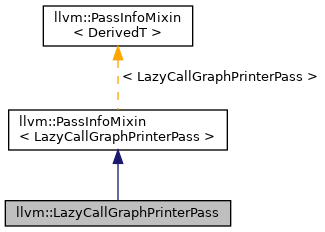 Definition at line 1771 of file LazyCallGraph.cpp. References llvm::PreservedAnalyses::all(), llvm::LazyCallGraph::buildRefSCCs(), C, llvm::LazyCallGraph::get(), llvm::Module::getModuleIdentifier(), llvm::AnalysisManager< IRUnitT, ExtraArgTs >::getResult(), llvm::LazyCallGraph::postorder_ref_sccs(), printNode(), and printRefSCC().